Lechmere is a station on its last legs. Once the Green Line West Medford extension is up and running, Lechmere will have been relocated and redesigned. Because of this, you can understand how the MBTA seems to be purposely neglecting the station. The tracks to Lechmere are over a hundred years old (but the station itself wasn't built until 1922 - the area was used for track connections with streetcars before), which explains why the area seems so dated. The station has peeling paint, a couple of billboard frames with nothing on them, and a dank busway. 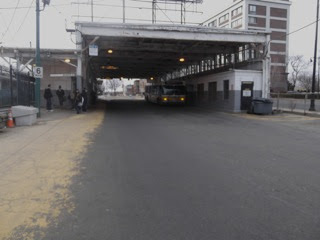 But don't think that Lechmere is all bad: the best part is the ride to it. The Green Line is above ground at Lechmere, and it makes for one of the best views on the system. Leaving Lechmere, the tracks turn a little while ascending until the train is elevated next to Monsignor O'Brien Highway. Buildings give way to a fantastic view of the Zakim Bridge. The train dips back below ground after Science Park, but it makes for a great 45 seconds. Back to the station itself: as I said before, it's not exactly pleasant to look at. Despite not being aesthetically pleasing, it does have one quality: the fare gates. With most above ground Green Line stations, you have to board from the front of the train to pay fares. It makes times at each station annoyingly long, and you just want the darn train to start moving. At Lechmere, though, there are fare gates, making much less waiting time. Sure, it doesn't help the fact that waiting for a train in the winter can be torture, but it makes it much faster to get onto the train, into the warmth. The Lechmere busway, on the other hand, has no qualities. Half of it is in a dark, dingy tunnel, and the other half of it is outside with no shelter. No matter where you wait, it will still be the same temperature, so don't think the tunnel will protect you from that. Lechmere is only served by 4 MBTA buses (plus the EZ ride shuttle), though they all have decent schedules. 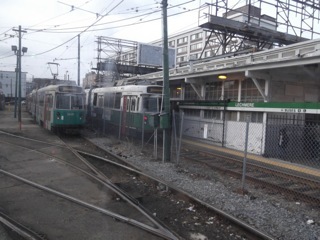 The 80, 87, and 88 serve Somerville and Arlington, while the 69 serves East Cambridge. The clouds really enhance the dinginess. Right now, being the closest station to East Cambridge and parts of Somerville, people use it. But how will the West Medford extension affect the ridership? Will it still be used as much as it is now? Only time will tell. But the current station is a piece of history. Go see it while you have the chance, if not for the station, then for the ride. We were waiting for the driver to get back from his smoke, so I took this picture from the train. Ridership: People who live in East Cambridge and Somerville, since it's the closest station to those areas. Also, shoppers visiting the Cambridgeside Galleria. Pros: The fare gates. I applaud the MBTA on shortening a long wait time. But the best part is the ride. If you're from out of town, the Lechmere ride is more than worth a look. Cons: The station is just so... dated. Paint is chipping everywhere, the busway is a mess, the billboard frames are ugly and pointless... still, though, with the MBTA's budget problems and the West Medford extension just around the corner, a big renovation isn't necessary. Also, it's a bit annoying how only the E Line serves the station. Why is it only served by one line? Nearby and Noteworthy: As I mentioned before, the Cambridgeside Galleria is a good mall. Also, though many people use Science Park to get to the Museum of Science (go figure), Lechmere is only a little farther from the museum, plus you get a great ride to boot. Latest MBTA News: There are Orange Line shuttle buses this weekend from Sullivan Square to Oak Grove... you know the drill. It really is a great view. 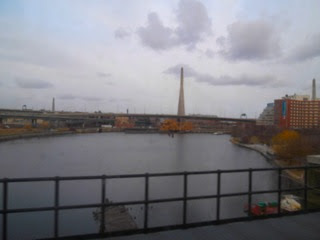 The Science Museum is on the other side surrounded by the Charles River Basin. It is one of the only times I've found myself wishing the train went a little slower. I agree. It is a great ride. However, since only the E line goes to Lechmere, you can't go to Auditorium unless you transfer. That's a big con. Lechmere should serve all of the lines, I hate that the D train terminates at Government Center and the B train terminates at Park Street because people would have to transfer to the north station or a Lechmere train to go to Haymarket, science museum and North Station. Hi gang... great blog. Now I do not want to start a holy war with you all, but I am from Texas. Last Oct I took my first green ride and kept having this internal dialogue... [unspoken voice on] ok, l.e.c.h.m.e.r.e spells LEK-meer [unspoken voice off]... just my unedited, first thought. Gracias! We have a different accent in Boston. It's fine.